Why are we so ill-prepared for disasters in the U.S.? This isn’t just anecdotal. A new survey by Farmers Insurance shows how many of us are vulnerable to a natural disaster, due to lack of planning alone. 70% of people living in the U.S. have experienced some kind of natural disaster. One-third of those say they’ve been in a hurricane. 60% of households do not have an emergency plan in place in case of a natural disaster. 55% of people living in the U.S. don’t have an emergency kit. 35% of those who do have an emergency kit and are pet owners don’t have any pet supplies in their emergency kit. The results of that survey gave me a jolt because I fall into the “don’t have” category every time. We haven’t discussed emergency planning around here since we became empty nesters, which makes no sense, but is sadly true. So I am more than ready to tackle the emergency plan and kit as outlined in the document. Know how you’ll receive emergency alerts. If the power goes out, as well as the Internet, how will you stay informed? A hand-powered or battery operated radio might be in order. Know your evacuation route and shelter plan. If you have to evacuate, where will you go? Think about which roads might or might not be open in the event of a disaster. For us, for example, we really need to figure that out because we are three miles down a dead-end road. We could easily be cut off and unable to evacuate without a plan. If you have pets, research pet-friendly shelters ahead of time. Know how you’ll get in touch with each other. Make sure everyone in the family has phone numbers memorized or written down in case a cell phone is lost and you can’t access your contacts. Then consider choosing a friend or family member who lives outside of the area as the contact point in case you can’t get in touch with each other. Know where you’ll meet. If one person is at work and another at school and a third at home, and when disaster hits, meeting at home won’t be an option, where will you meet instead? You can see the full list here. Note that most of these items are things you should have on hand, even if you don’t need to evacuate. So have this stuff handy regardless, okay? The year 2017 was the costliest ever, with natural disasters causing $306 billion worth of damage. As we near the end of 2018, it seems we had an easier year, but one thing is for certain: Natural disasters will always be a threat. We can’t do anything about that or the destruction they will do, but we can take steps to keep ourselves and our families safe by preparing ahead of time. And according to Farmers Insurance, 60% of us need to get our acts together and get ready! There’s something about September that makes me want to get organized. Maybe it’s the start of the new school year, which I’m still in tune with even though we’re empty nesters. I still get a thrill walking past the busy school supplies aisle while at the store, for goodness’ sakes! Whatever it is about this time of year with the golden light and the cooler mornings, I get the urge to tackle projects, wrap up loose ends, and start anew. And that includes thinking about safety and security as the days get shorter, both at home and at work. It’s easy to use! Print it out, work your way through it, and check the items off. It’s applicable to work too! In the wake of yet another hurricane (hello, Florence), we can get wrapped up in disaster preparedness and thinking about emergency situations. But the reality is we are more likely to get hurt or burgled during a normal day than we are to find ourselves caught in a natural disaster situation. And that’s why a simple safety audit like this one is a good way to go, to take steps to increase safety and security at all times. If you own a business or work offsite at one, take a look at this checklist and consider printing it out, doing a walk-through, and fixing some of those little issues that put you at risk. 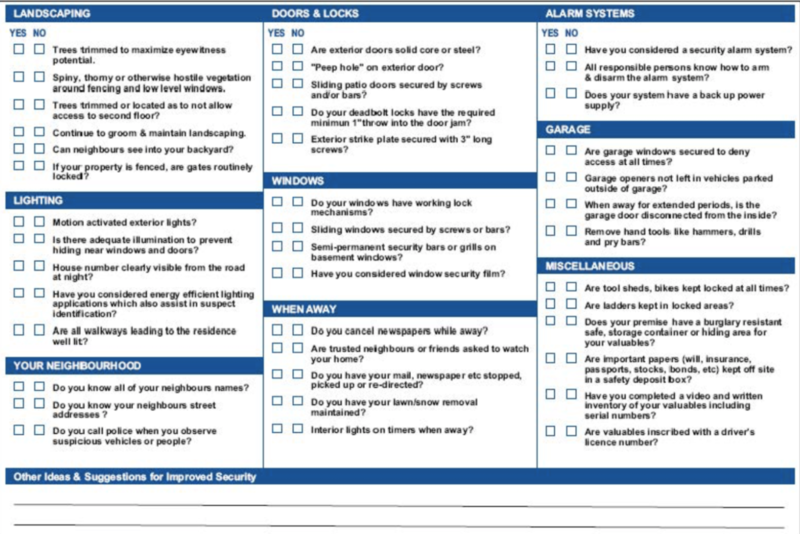 If you want to do a more thorough job and address disaster preparedness too, you can find a much more detailed workplace safety checklist offered by the Nonprofit Risk Management Center. There you’ll also find hundreds of checklists, forms, job descriptions and other resources, all focused on workplace safety. Guess who got the latest sextortion scam email? Yep! Lucky me! The email goes on to make accusations and to threaten exposing me unless I pay an extortion fee via bitcoin. You can read the text of the email here, as it’s making the rounds and plenty of people have received it. Warning: It’s nasty. So it’s a scam. So what, right? Why didn’t I just delete it? Why was it such a big deal to get this email? There were two reasons why this email surprised me: One, I have my spam filter set very high, so I almost never get spam in my inbox. How did this one get past? I don’t know. And two, the subject line included a password that I’ve used a lot and no one would be able to guess. That got my attention right away, believe me! So again, how did they get my password? When it was stolen as part of a data breach, it turns out. One very good lesson was learned with this disgusting email: I found out I could go to https://haveibeenpwned.com and see which data breaches have included my data. I strongly advise you to do this as well. I was shocked to see that my data had been compromised in eight (yes, eight!) different data breaches. That’s where the scammers got my old password. I reviewed the list and made sure I had updated any necessary passwords or deleted accounts for each of the breaches. Sadly, one was a marketing firm that collects information on people to sell, and there isn’t anything I can do about that—except be annoyed that the information is collected and sold without my knowledge. The final benefit to this experience was a renewed commitment on my part to using stronger passwords, as well as keeping up with changing passwords on a regular basis. To be more vigilant about your own passwords, follow this advice. The sense of violation I felt to have this email in my inbox, the fear caused by the threatening tone even though I knew it was bogus, and the sorrow in knowing that there are people out there who will pay the extortion money are all still with me. It’s hard to shake off that negativity, and that angers me more than the actual email. But the scammers gave me a gift: new insights into keeping me and my data safe. I hope you’ll put these insights to work to protect your information as well. We have just returned from an amazing trip to a foreign country and I have bad news: I saw as many people glued to their smart phones there as I see in the U.S. On the one hand, you might argue that that’s a good thing, because it shows we live in a global, connected world. I say it’s a case of FOMO (Fear Of Missing Out) that has us all glued to our phones, but we should have another fear instead: the consequences of staring at our small screens. What does it matter that we have home security systems and fancy car locks and smoke detectors if the real risk to our safety is the phone in the palm of our hand? Because if you look at the research, those phones are causing accidents and even deaths—and they would be less of a threat if we could simply put them away sometimes. If reading that section above didn’t make you want to spend a little less time with your smart phone, let’s talk about the consequences on our physical well-being. Smart phone use is bad for our eyes, our posture, and our sleep. People who spend a lot of time on their smart phones are more likely to develop carpal tunnel syndrome, pain, muscle spasms, and chronic diseases. We can get eye strain and even dry eye syndrome. Our necks are bent down and our arms are uplifted in unnatural ways for long periods of time. That’s gotta hurt at some point! And bright phone screens suppress melatonin levels, making it harder to go to sleep. Spending so much time on our phones is dangerous as we drive and walk. It’s bad for our physical well-being. And, ironically, it’s bad for our mental and social health too. Kids and teenagers disconnect from the world around them—we’ve all witnessed that. But adults can do the same when too caught up in those tiny screens. Heavy duty cell phone use also reduces our brain activity and makes it harder to pay attention, either to a task at hand or to a conversation. Socially, we’ve seen a huge increase in depression and suicides among teens, and convincing research links those increases at least in part to smart phone usage because of social media. I am as thankful for my phone as the next person. I can keep up with my kids, find my way to a restaurant, check the weather, and stay on top of work email when out of the office. With some apps, I have no choice but to use my phone—like if I need to buy a train ticket. But we all must be aware that there is a time and a place to have that phone out and our attention focused on that, and a time and a place to be focused on what’s going on in the world around us—no matter where in the world we live. Are you planning a getaway this summer? Don’t answer that! Or at least don’t answer it publicly. Because you really don’t want to make your vacation vacancy public knowledge, although it’s easy to be tempted to do so. It’s shocking how much information people will reveal on Facebook, including details about their upcoming trips. Sure, you’re anticipating that getaway, whether you’re headed to the annual family reunion or you’re going to the beach. But posting about it ahead of time puts your home at risk when someone who does not need to know your house will be empty finds out your house will be empty! Once you’re gone on your trip, post your pictures after you get home rather than advertise to the world that your house is sitting empty. This also gives you time to sort through the pictures so you only post the best of them, not all of them, because really, no one wants to see all of them. In addition, not posting means no geotagging of photos, which can happen automatically without your knowing. Geotagging tells people wherea picture was taken, and not everyone needs to know your exact location at every minute of the day. Even if you don’t think you have reasons to keep your location to yourself, wouldn’t you rather err on the side of just a little more privacy than a little less? If you simply can’t help yourself and you’re going to post pictures while away, avoid tagging the people you’re travelling with just in case they have different views about privacy. What’s fine for you to share might be too much for them. None of this is to say you shouldn’t be allowed to do some bragging once you’re back! Of course you want to talk about the wonderful time you had and share your favorite pictures…and you should! It’s just the timing that we’re concerned with. Wait until you’re home again and your home is no longer vacant before you tell your vacation tales. P.S. For tips on posting pictures people will like and respond to (while avoiding pictures you might regret later), see this useful advice. Passwords. They are a necessary part of our lives, but we simply do not give them the attention they deserve. Just like exercise keeps us fit and healthy eating keeps us slim, so do strong passwords keep us safe. So why do we continue to neglect them? Since we just had World Password Day on May 3 this year, the day we should all change our passwords, it seemed a good time to revisit the topic and see if we can’t up our game—and our level of security. So here’s the good news bad news on passwords in 2018…bad news first. You can see a full list of the 100 worst passwords of 2017. And if you see your password on that list, change it! It’s not all bad news for World Password Day, however. Despite our tendency to choose poor passwords still, technology is making it easier for us to keep our information and data secure—should we choose to act on it. This year at the World Password Day website, you’ll see a campaign for #LayerUp. Layering up simply means adding another “layer” of protection by requiring more than one step to access your data. Called either multi-factor authentication (MFA) or two-factor authentication (2FA), it’s a way to make your password require something else too, like a fingerprint or a code sent to your cellphone. To try it out, I logged into my bank account online and sure enough found the setting to add the second layer right away. Now when I log in, I will need my password and a code sent to my cell phone. It took me less than a minute to do, and I’m glad I took the time. All you do is visit www.twofactorauth.org to find out if a website offers the extra layer, and many popular banking and social media websites do. The World Password Day website still encourages a strong password (see password advice here), and we still encourage you to beef up those passwords a.s.a.p., but in addition to that, you can easily add this extra step or layer—and keep your information that much safer from those who would like to compromise it.